It’s crazy to me that Andrew Benintendi was the rookie of the year runner-up and there are still people out there complaining about his underwhelming season. 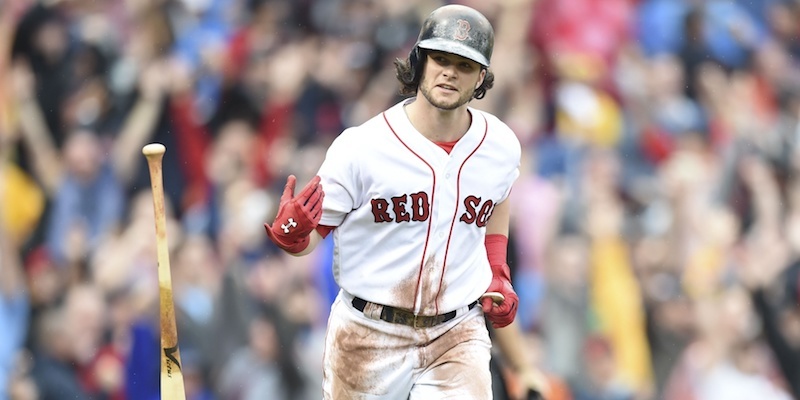 After a minor league career that only lasted 150 games – roughly one Triple-A season – Benintendi spent the majority of his first full season in the majors hitting either second or third in the order. He’s probably the most untouchable player on the roster who’s not named Mookie (although I could hear an argument for Devers being number two). Barring the increasingly inevitable trade of Jackie Bradley Jr, Benintendi is the locked in as the future left fielder for the Red Sox going forward. There are certainly things that he can improve upon – he’ll still be 23 on Opening Day next year – but even replicating last year’s numbers would be another impressive season. With Dave Dombrowski bluffing hinting at the idea that the Red Sox are more concerned with extending current players than chasing free agents, it seems like an especially safe bet to assume Benintendi continues be a viewed as a team centerpiece. Speaking as a whole, hitting .271/.352/.424 with a 103 wRC+ in your first full major league season is a promising start. He hit 20 home runs too, which was a pleasant surprise. It’s not that Benintendi didn’t posses 20-home run power, but more so the fact that he got there in season one that’s so exciting. He also exhibited signs of a more patient approach at the plate, walking more often (10.6 percent walk rate) than he did last year (8.5 percent) and cutting back on strikeouts this season (17.0 pecent strikeout rate vs 21.2 percent in 2016). His contact numbers look marginally better, but it’s hard to make any serious comparisons when Benintendi only played in 34 games last season. Ultimately, his success will be measured on how well he can improve from last season’s numbers, which is a bit of a double-edged sword. Since this is the What Went Well section, let’s choose to focus on what kind of player Benintendi can be as he continues to barrel closer to his prime. May, July, and September! On a larger scale, it’s not ideal that every other month Benintendi was abysmal on offense. But such is life with young players, and it’s not unrealistic to think that he still has a fair amount of development in front of him. He clearly goes through spells where he’s not making good contact, as his batted ball numbers plummet and his strikeout rate rises during those “bad” months. More consistency would go a long way towards solidifying Benintendi as one of baseball’s best young players, although it’s not like the Rookie of the Year runner up has a whole lot more to prove. He could probably have a stronger arm and could almost definitely be a better baserunner. Still, he’s a young player with tons of potential who, at this point, is prone to the same peaks and valleys that all other great young players deal with. For what it’s worth, Aaron Judge hit .169 in July and .185 in August. Quite frankly, the homer in me wants to expect Beintendi to hit over .300 with 20 homers and 20 steals again, which doesn’t seem totally unrealistic. That almost definitely won’t happen, though, and I’ll settle for .285/.370/.450 and some improved base running. Benintendi has consistently proven the ability to adjust to how he’s being pitched, so I expect nothing less from him going into next season. His ability to adapt is a not insignificant part what makes him such a special player, and he figures to be a key contributor to the Red Sox offense next year, even with Stanton, Hosmer and Martinez all on the team as well.